Iran-backed rebels in Yemen claim they have found what an unconfirmed Iranian report describes as “a large cache of Israeli-made weapons and ammunition” in Saudi Arabia‘s embassy in the war-torn country’s capital of Sanaa. According to a report in the semi-official Fars news agency published Saturday, the rebels discovered the arms after overtaking all of the embassy’s guards after heavy fighting in the capital. 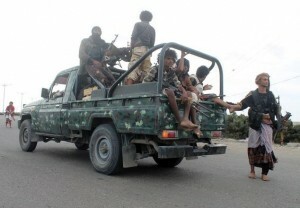 The report further claimed that Houthi rebels also discovered documents indicating the U.S. was planning to establish a base on an island off the southwest coast of Yemen in the Red Sea. Iranian-backed Houthi rebels seized Sanaa last September, thrusting Yemen into sectarian turmoil. Seeing the Houthi advance as a bridgehead for Iranian influence in the region, a Saudi-led coalition of Arab nations began air strikes this March in a campaign to restore Yemeni President Abd-Rabbu Mansour Hadi to power. In April, the report continued, Yemeni officials reportedly admitted that Riyadh made use of Israeli weapons in its airstrikes on Yemen. “The Saudis are using Israeli weapons in their raids on Yemen,” Yemeni army commander Taher Rasoul Zadami reportedly told Fars at the time.